Gottman Method Couples Therapy and the Sound Relationship House Theory were built upon four decades of scientific research. Over time, it will no doubt be modified, as the therapy is made more effective by empirical self-examination. In the Gottman scientific research program there were three phases. The first phase of our research was devoted to the discovery of reliable patterns in observational data. In the research with couples, we needed to see if there were indeed patterns of behavior, or sequences of interactions that could discriminate happy from unhappy couples. It was not at all clear that these patterns existed. Roger Bakeman and I (using Jim Sackett’s ideas) began developing the math for sequential analysis, which now is a well developed methodology. We began discovering consistent sequences that differentiated happily married from unhappily married couples. I wrote about this work in a book called Marital Interactions: Experimental Investigations (Academic Press, 1979). Research on couples had begun in 1938 with the publication of a book by Louis Terman. They had interviewed couples and given them questionnaires, but systematic observation of couples only started in the 1970s in my lab and a few others around the USA. Psychology at that time was having a great deal of difficulty establishing reliable patterns in the personality of one individual. State of the art advice was that psychologists should not study couples, because the unreliability in studying one person might be squared in studying two people. That advice was wrong. There was tremendous regularity in a couple over time. The Gottman lab discovered these interaction patterns (using an observational coding system that scored videotapes that we called the Couples’ Interaction Scoring System, or CISS) first in a published study of couples with a University student population. Later, a grad student of mine, Mary Ellen Rubin, for her dissertation repeated the same experiment with couples in rural Indiana. Amazingly, the CISS numbers in the two studies differed only in the second decimal place. In a series of research studies, I developed new observational coding systems with my student Cliff Notarius, and the lab applied brand new methods for studying sequences of interaction developed by Jim Sackett and Roger Bakeman for examining sequences of interaction. Following Thibaut and Kelley’s 1959 book The Social Psychology of Groups, I built a device called a “talk table,” in which people could interact and also rate how positive or negative their intentions were and how positive or negative were the impacts of the messages they received. This was the first application of game theory to couples’ interaction. Our lab used these methods to define reliable patterns of interaction and thought during conflict. Following a series of peer-reviewed journal articles, in 1979 I published these results in a series of scientific papers and a book called Marital Interaction: Experimental Investigations (NY: Academic Press). The second phase of the Gottman research program was devoted to trying to replicate these findings and focused on prediction. Prediction in psychology means being able to predict important outcomes from the patterns observed. That phase was also effective. The patterns and sequences we observed were able to discriminate happy from unhappy couples in repeated studies. In 1976, Robert Levenson and I teamed up to combine the study of emotion with psycho-physiological measurement and a video-recall method that gave us rating dial measures (still applying game theory) of how people felt during conflict. That was the new way of getting the “talk table’ numbers. The research also became longitudinal. We made no predictions in the first study, but we were interested in a measure of “physiological linkage,” because a prior study showed that the skin conductance of two nurses was correlated only if they disliked one another. We thought that might be linked to negative affect in couples. Indeed it was. We were also amazed that in our first study with 30 couples, we were able to “predict” the change in marital satisfaction almost perfectly with our physiological measures. “Time 2” was 3 years later than “Time 1.” The correlations were very high with Time-2 marital satisfaction (from the .70s to the 90s), controlling for Time-1 marital satisfaction. The results were that the more physiologically aroused couples were in all channels (heart rate, skin conductance, gross motor activity, and blood velocity) the more their marriages deteriorated in happiness over a three-year period, even controlling the initial level of marital satisfaction). The rating dial and our observational coding of the interaction also “predicted” changes in relationship satisfaction. We had never seen such large correlations in our data. Furthermore, we had preceded the conflict conversation with a reunion conversation in which couples talked about the events of their day before the conflict discussion, and they had followed the conflict discussion with a positive topic. What was amazing was that harsh startup by women in the conflict discussion was predictable by the male partner’s disinterest or irritability in the events of the day discussion. We had then discovered that the quality of the couple’s friendship, especially as maintained by men, was critical in understanding conflict. Furthermore, the ability to rebound from conflict to the positive conversation became a marker of emotion-regulation ability of couples. Bob Levenson and I had discovered Paul Ekman and Wallace Friesen’s Facial Affect Coding System (FACS), and we subsequently developed the Specific Affect Coding System (SPAFF), which was an integration of FACS and earlier systems in the Gottman lab. The SPAFF became the main system that we used to code couples’ interaction. At first it took 25 hours to code 15 minutes of interaction, but later I was able to get the same coding done in just 45 minutes, with no loss of reliability. I also began applying time-series analysis to the analysis of interaction data. I wrote a book on time-series analysis to explain these methods to psychologists, and developed some new methods for analyzing dominance and bi-directionality with James Ringland. To create these time series from observational data, I summed SPAFF codes in 6-second blocks using weights in terms of the ability of the codes to predict divorce (for example, because they were such good predictors of stability or divorce, contempt got a weight of -4, and humor a weight of +4, while anger and sadness were weighted only -1). Dr. Levenson and I then got our first grant together and began attempting to replicate our observations from the first study. The subsequent studies that they conducted in our labs (some with colleagues Laura Carstensen, with Lynn Katz, with Sybil Carrere, and with Neil Jacobson) eventually spanned the entire life course (from a study following newlyweds through the transition to parenthood, through a study of two groups of couples at Berkeley in the Levenson lab on the transition through retirement; the old couples’ study involved following couples for 20 years – in Levenson’s Berkeley lab). The Gottman lab at the University of Illinois also studied the linkages between marital interaction, parenting, and children’s social development (with Lynn Katz), and later at the University of Washington involved studying these linkages with infants (with Alyson Shapiro). I began studying families, at first examining children from age 3 longitudinally up to age 15. I developed the concept of Meta-Emotion, which is how people feel about emotion, specific emotions (like anger) and emotional expression and emotional understanding in general. Meta-emotion mismatches between parents in that study predicted divorce with 80% accuracy. The idea of emotion coaching emerged from that research, which was a scientific validation of the work of child psychologist Haim Ginott. In a newlywed study, I began studying the transition to parenthood and learning how to do research on babies and parents. 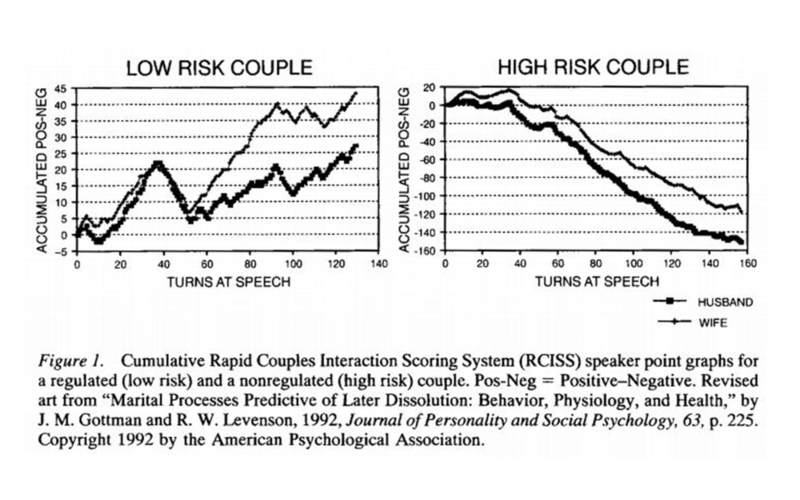 Bob Levenson and I discovered that couples interaction had enormous stability over time (about 80% stability in conflict discussions separated by 3 years). We also discovered that most relationship problems (69%) never get resolved but are “perpetual” problems based on personality differences between partners. That was discovered by seeing couples in the lab every 3 years, then every 6 years, and so on. In seven longitudinal studies, including one with violent couples (with Neil Jacobson), the predictions replicated. We could predict whether a couple would divorce with an average of over 90% accuracy, across studies using the ratio of positive to negative SPAFF codes, the Four Horsemen of the Apocalypse (Criticism, Defensiveness, Contempt, and Stonewalling), physiology, the rating dial, and an interview we devised, the Oral History Interview, as coded by Kim Buehlman’s coding system. We could predict whether or not our stable couples would be happy or unhappy using measures of positive affect during conflict, which Jim Coan and I discovered was used not randomly but to physiologically soothe the partner. We also discovered that men accepting influence from women was predictive of happy and stable marriages. Bob Levenson also discovered that humor was physiologically soothing, that empathy had a physiological substrate (with Anna Ruef) using our rating dial. Neil Jacobson and I collaborated in a basic study of domestic violence with 4 groups of couples: (1) happily married, nonviolent, (2) unhappily married, nonviolent, (3) situationally violent couples, and (4) characterologically violent men. We discovered a typology of battering that has mostly been replicated in the literature. In 1986, we built an apartment laboratory at the University of Washington and my student Janice Driver took a decade (first as a volunteer and then a doctoral student) discovering the basis of friendship and intimacy and its relation to conflict in their Bids and Turning Coding System. With that work the discovered how couples create and maintain friendship and intimacy and how it was related to conflict. For example, newlyweds who divorced 6 years after the wedding had turned toward bids 33% of the time, while newlyweds who stayed married 6 years after the wedding had turned toward bids 86% of the time. The idea of the friendship “emotional bank account” was verified. It was related to repair of negativity, and, amazingly to the quality of sexual intimacy. When 14-year longitudinal data became available, Levenson & I discovered a second dysfunctional pattern, emotional disengagement. It was marked by the absence of positive affect during conflict (no interest, affection, humor, or empathy). Now we could predict not only if a couple would divorce, but when. Couples who had the Four Horsemen divorced an average of 5.6 years after the wedding, while emotionally disengaged couples divorced an average of 16.2 years after the wedding. That was a very new finding. Levenson, Carstensen, and I began studying marriage in later life with two groups of couples in the Bay Area, one in their 40s and one in their 60s. Thanks to Levenson’s tenacity that has turned out to be a 20-year longitudinal study that his lab is now finishing. Levenson and I also conducted a 12-year study of gay and lesbian couples, work we published in two papers in the Journal of Homosexuality. Patterns replicated across the life course, and they replicated for gay and lesbian couples as well. 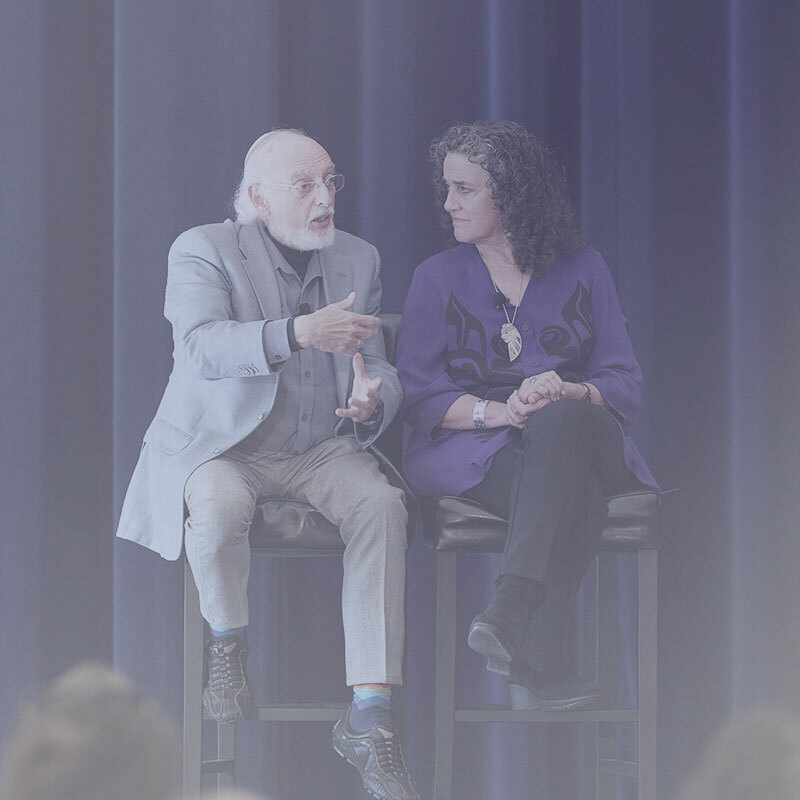 The third phase of the Gottman research program was devoted to trying to understand the empirical predictions, and thus building and then testing theory. The idea here is to build a theory that is testable, or disconfirmable. That is the hallmark of good science. Testing theory in our field requires clinical interventions. 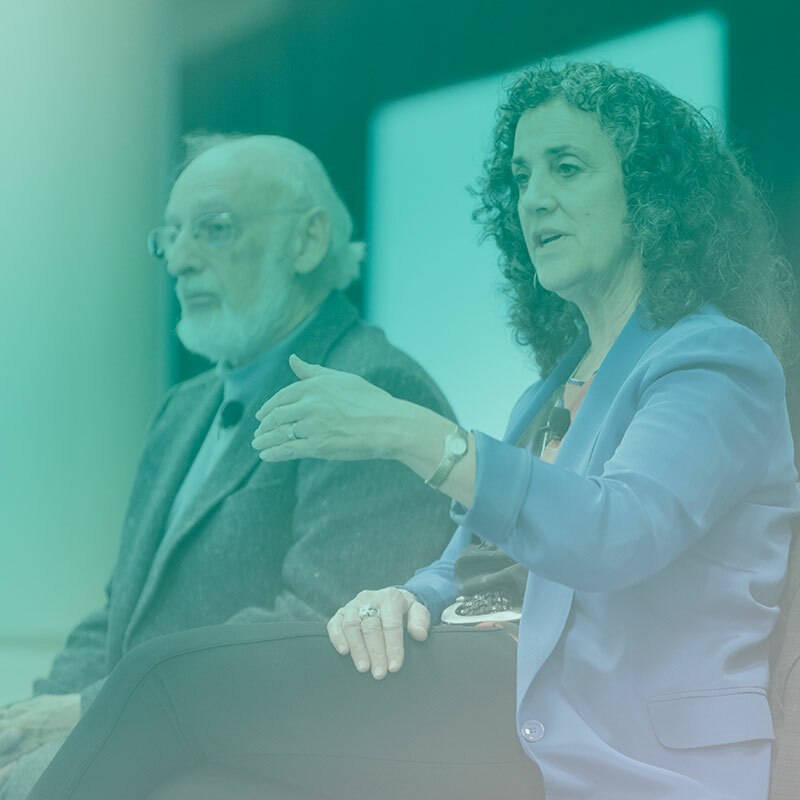 The Gottman lab returned to intervention research 17 years ago (in 1996) with Dr. Julie Schwartz Gottman. We designed both proximal and distal change studies. In a proximal change study, one intervenes briefly with interventions designed only to make the 2nd of two conflict discussions less divorce prone. In one of these studies, we discovered that a 20-minute break in which couples stopped talking and just reading magazines (as their heart rates returned to baseline) dramatically changed the discussion so that people had access to their sense of humor and affection. Together with Dr. Julie Schwartz Gottman, we started building the Sound Relationship House Theory. That theory became the basis of the design of clinical interventions for couples in my book The Marriage Clinic, and Julie’s book, The Marriage Clinic Casebook. We founded The Gottman Institute in August 1996. At the same time, as part of theory building, the world-class award-winning mathematical biologist James Murray and his students began working with me on building a mathematical model of relationships, which led eventually to the publication of The Mathematics of Marriage (2002, MIT Press). This math created nonlinear difference and differential equations of actual couple interactions, which was a fulfillment of von Bertalanffy’s classic book General System Theory a book that started family systems therapy in the 1960s. These nonlinear equations made it possible to simulate a couple’s interaction under new conditions and then test these simulations with real experiments. The equations represent a new language for analyzing and understanding couple interactions. My recent book titled Principia Amoris: The new science of love (2015, NY: Routledge) discussed this modeling and applied it to couples’ therapy. It is important to note that Gottman Method Couples Therapy and the Sound Relationship House Theory were built upon scientific research, and the theory emerged from that same basic research. The Gottman Method is not a “school of therapy,” but a work in progress that should always be based on solid empiricism. The Sound Relationship House Theory is designed to be totally disconfirmable, subject to empirical testing. Its assumptions are clearly spelled out in the Gottman Method Couples Therapy: Level 1 Training for clinicians. Over time, it will no doubt be modified, as the therapy is made more effective by empirical self-examination. The theory has already been modified as a result of more research. Julie and I first began testing our interventions by exploring what happened to a couple when the first baby arrived. In this longitudinal study, we began studying young couples in first marriages a few months after their wedding, following couples into pregnancy and studying parent-infant interaction using the Lausanne Triadic Play paradigm. We discovered that 67% of couples experienced a precipitous decline in relationship satisfaction in the first 3 years of the baby’s life. My graduate student Alyson Shapiro compared the 33% of couples who did not experience the downturn in satisfaction with the 67% who did. This is the same method of comparing the masters to the disasters and designing the therapy empirically. We studied them even a few months after their wedding, and during pregnancy as well. We developed the Pregnancy Oral History Interview. The predictions of the baby’s temperament from the last trimester of pregnancy was impressive, done by my student, Eun Young Nahm. Furthermore, Alyson Shapiro’s thesis showed that we could predict the baby’s vagal tone, how much the baby laughed and cried at 3 months from the way the couple discussed a conflict in their last trimester. Again, based on the differences between the “masters” of relationships and the “disasters” of relationships, Julie and I designed a couples workshop and a couples therapy. Based on the comparison of the couples who declined and did not decline in relationship satisfaction after baby, we designed the highly effective “Bringing Baby Home” (BBH) workshop. We performed a randomized clinical trial study with long-term follow up. That workshop has now been taught to 1,000 birth educators from 24 countries. The effects have been replicated in Australia and Iceland. References follow. Shapiro, Alyson Fearnley; Gottman, John M.; Carrére, Sybil (2000). The baby and the marriage: Identifying factors that buffer against decline in marital satisfaction after the first baby arrives. Journal of Family Psychology, Vol 14(1), 59-70. Shapiro, A.F., and Gottman, J., (2005). Effects on marriage of a psycho-communicative- educational intervention with couples undergoing the transition to parenthood, evaluation at 1-year post-intervention, Journal of Family Communication 5(1), 1-24. Shapiro, Alyson F.; Nahm, Eun Young; Gottman, John M.; Content, Kristi (2011). Bringing baby home together: Examining the impact of a couple‐focused intervention on the dynamics within family play. American Journal of Orthopsychiatry, Vol 81(3), 337-350. Gottman, John; Gottman, Julie; Shapiro, Alyson. A new couples approach to interventions for the transition to parenthood. (2010). In Schulz, Marc S. (Ed); Pruett, Marsha Kline (Ed); Kerig, Patricia K. (Ed); Parke, Ross D. (Ed), Strengthening couple relationships for optimal child development: Lessons from research and intervention. Decade of behavior (science conference), (pp. 165-179). Washington, DC, US: American Psychological Association. Hedenbro, Monica; Shapiro, Alyson F.; Gottman, John M. (2006). Play With Me at My Speed: Describing Differences in the Tempo of Parent-Infant Interactions in the Lausanne Triadic Play Paradigm in Two Cultures, Family Process, Vol 45(4), 485-498. Second, we turned to the emotion-coaching intervention (described in Raising an Emotionally Intelligent Child). That intervention has been evaluated in 3 randomized clinical trials by Australian psychologist Sophie Havighurst, and has also been found effective in a study in South Korea led by Certified Gottman Therapist Dr. Christina Choi both in 2 orphanages in Seoul and in Busan. Emotion coaching is now being taught to teachers throughout South Korea. For Havighurst’s papers and programs, see her website tuningintokids.org.au. Research and training is also taking place in the UK on emotion coaching. See references below. Gottman, John M.; Katz, Lynn F. (1989). Effects of marital discord on young children’s peer interaction and health. Developmental Psychology, Vol 25(3), 373-381. Gottman, J.M., Katz, L.F., & Hooven, C., (1997). Meta-Emotion: How Families Communicate Emotionally – Links to Child Peer Relations and Other Developmental Outcomes, Lawrence Erlbaum Associates. Gottman, J.M., and DeClaire, J., (1997). Raising an Emotionally Intelligent Child: The Heart of Parenting, Simon and Schuster. Havighurst, SophieS. ; Duncombe, Melissa; Frankling, Emma; Holland, Kerry; Kehoe, Christiane; Stargatt, Robyn. (2015). An emotion-focused early intervention for children with emerging conduct problems. Journal of Abnormal Child Psychology, Vol 43(4), 749-760. Kehoe, Christiane E.; Havighurst, SophieS. ; Harley, Ann E. (2014). Tuning in to teens: Improving parent emotion socialization to reduce youth internalizing difficulties. Social Development, Vol 23(2), 413-431. Lauw, Michelle S. M.; Havighurst, SophieS. ; Wilson, Katherine R.; Harley, Ann E.; Northam, Elisabeth A. (2014). Improving parenting of toddlers’ emotions using an emotion coaching parenting program: A pilot study of Tuning in to Toddlers. Journal of Community Psychology, Vol 42(2), 169-175. Wilson, Katherine R.; Havighurst, SophieS. ; Harley, Ann E. (2014). Dads Tuning in to Kids: Piloting a new parenting program targeting fathers’ emotion coaching skills. Journal of Community Psychology, Vol 42(2), 162-168. Rose, J., Gilbert, L. & Smith, H. (2012) ‘Affective teaching and the affective dimensions of learning’ in Ward, S. (ed) A Student’s Guide to Education Studies. London: Routledge. The master/disaster comparisons and analyses across our studies have led to what has come to be called “Gottman Method Couples Therapy.” A randomized clinical trial of a 2-day workshop (with follow up) that is a dismantling study has been published in the Journal of Family Therapy. 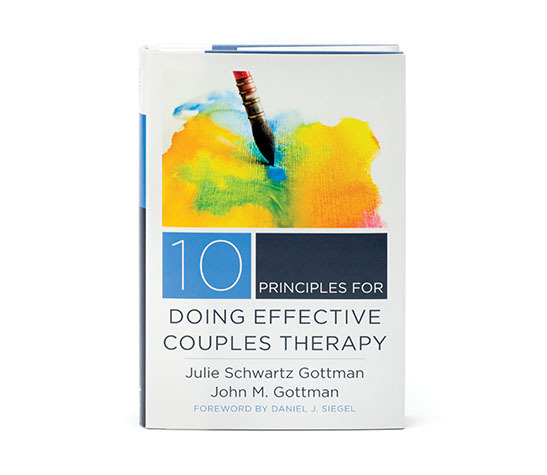 Babcock, Julia C.; Gottman, John M.; Ryan, Kimberly D.; Gottman, Julie S. (2013). A component analysis of a brief psycho‐educational couples’ workshop: One‐year follow-up results. Journal of Family Therapy, Vol 35(3), 252-280. A second study examining the effects of 9 added sessions of couples’ therapy showed that relapse could be drastically reduced for more distressed couples with the added therapy sessions. The results of that second study have not been published, but are available only in Kim Ryan’s dissertation at the moment. Julie and I extended our work to lower-income unmarried couples with a new baby in a program called Loving Couples Loving Children (LCLC). That intervention is a couples group intervention with 21 two-hour sessions that begin with talk-show segments that initiate group self disclosure. The talk shows were led by Julie Gottman. The LCLC intervention was evaluated by the policy group, Mathematica Policy Research in a randomized clinical trial with 3,500 couples, and effectiveness was demonstrated, especially with African-American couples. That study has not been published, but a summary report can be obtained from the Mathematica website. The program was also tested by MDRC with married couples at two sites, one in Shoreline WA, and one in the Bronx, NY. The report on that study can be obtained from MDRC (Manpower Development Research Corp.). Fourth, we modified LCLC into the Couples Together Against Violence (CTAV) curriculum for situational domestic violence. In that intervention (also with Mathematica Policy Research) the same couples’ group approach was used with 4 added modules, and the use of the Heart Math “emwave” biofeedback device before every interaction exercise in the group. Couples have to become calm (get in the “green zone”) before beginning each exercise in the group. The Relationship Research Institute completed a randomized clinical trial study with 18-month follow up with a group of situationally violent couples. The CTAV program has been shown to be effective, and these effects last. A replication study is now being planned with a briefer intervention in Julia Babcock’s laboratory at the University of Houston. It is important to point out that Babcock’s meta-analysis of male-only groups treating domestic violence showed that no intervention was more effective than one arrest. Hence, the emotionally-focused CTAV study is a first. The effects of the randomized clinical trial of the CTAV intervention with situationally violent couples have been published in a series of papers. What is unique about this work: (1) It is manualized, with training videos, (2) effects last upon 18-month follow up after treatment termination, and (3) the intervention was evaluated with physiological and observational methods as well as archival police records. We are currently attempting to extend this work in Oregon with a more seriously disturbed court-referred sample, under Julia Babacock’s supervision. References follow. Bradley, Renay P. Cleary; Drummey, Kaeleen; Gottman, John M.; Gottman, Julie S. (2014). Treating couples who mutually exhibit violence or aggression: Reducing behaviors that show a susceptibility for violence. Journal of Family Violence, Vol 29(5), Jul 2014, 549-558. Bradley, Renay P. Cleary; Gottman, John M. (2012). Reducing situational violence in low‐income couples by fostering healthy relationships. Journal of Marital and Family Therapy, Vol 38(Suppl 1), 187-198. Friend, Daniel Joseph; ClearyBradley, Renay P.; Thatcher, Rebecca; Gottman, John M. (2011). Typologies of intimate partner violence: Evaluation of a screening instrument for differentiation. Journal of Family Violence, Vol 26(7), 551-563. When (and if) we replicate this work in Oregon, we plan to being training clinicians to use CTAV. Fifth, in collaboration with Dr. Julia Babcock (a former graduate student, now professor at the University of Houston), an initial randomized clinical trial study was performed with very difficult characterologically violent married men. She used brief audio training tapes I developed to modify the conflict interaction of these violent men with their wives, obtaining significant proximal changes in interaction and in the satisfaction of wives with the nature of the interaction following treatment. This research is clearly just at the beginning phase. Babcock, JuliaC. ; Graham, Katherine; Canady, Brittany; Ross, Jody M. (2011). A proximal change experiment testing two communication exercises with intimate partner violent men. Behavior Therapy, Vol 42(2), 336-347. More recently the theory building has been concerned with applying game theory in a new way toward an understanding of how couples build trust and loyalty, versus erode trust and create betrayal. New metrics for trust and betrayal have been created and validated. That work has led to two books, The Science of Trust and What Makes Love Last? With Dr. Paul Peluso, a randomized clinical trial study is planned for couples trying to heal after an extra-marital affair. It is reasonable to ask what the current status of evidence for the effectiveness of Gottman Method interventions. Here is the current status. Proximal Change Experiments. I suggested that a couples therapy program could be built empirically by performing a series of “proximal” change studies. In these studies, the goal is smaller than the goal of couples therapy. The proximal goal is only to change specific aspects of a couple’s relationship, for example how they begin a conflict discussion, and then examining the effect of that intervention on the second of two conflict discussions. These proximal change studies were examined in a study with Kim Ryan (published) and a dissertation with Amber Tabares (as yet unpublished). These studies showed that it was possible to create change in couples’ interaction with very brief interventions, which were later grouped into the 2-day couples’ workshop called The Art and Science of Love. Randomized Clinical Trial of Workshops and Gottman Method Couples Therapy. In a randomized clinical trial that became Kim Ryan’s dissertation, a one-day workshop on building friendship, a one-day workshop on conflict regulation, a two-day workshop combining both, and an added group that added 9 sessions of Gottman Method Couples Therapy were compared, with a 1-year follow up. Effectiveness was demonstrated, with the greatest 1-year effectiveness and least relapse for the combined 2-day workshop together with 9 sessions of Gottman Method Couples Therapy. Information, materials, and training at www.gottman.com. Bringing Baby Home. A randomized clinical trial with the BBH workshop compared to a control group showed powerful effects in reversing the drop in marital satisfaction, reducing post-partum depression, reducing inter-parental hostility, improving the parents’ interaction with baby, and improving the baby’s emotional and language development. The paper is published with Alyson Shapiro. That intervention is being taught to birth educators by The Gottman Institute. That intervention has also had large effects when tested in hospitals in Australia and Iceland. For copies of this and other papers see www.johngottman.net. Loving Couples Loving Children (LCLC). That program was developed by Dr. Julie Schwartz Gottman and I for lower-income couples who probably did not see school as a positive experience. It is based on a 21-session couples’ group curriculum with talk show segments initiating self disclosure and skill building. It was evaluated by Mathematica in a randomized clinical trial with 3,500 fragile-family unmarried couples, all expecting a baby. That intervention was shown to be highly effective, especially for African-American couples. Couples Together Against Violence (CTAV). In a randomized clinical trial completed at The Relationship Research Institute (RRI), a couples’ group intervention for situational domestic violence has demonstrated long-term effectiveness on 18-month follow up. Information, materials, and training are currently being prepared by The Gottman Institute. Emotion Coaching with Children. The work Katz and I have done in the area of Meta-emotion (see the books Meta-emotion with Lynn Katz and Carole Hooven, Training DVDs available from the Talaris Research Institute at www.gottman.com, the What Am I Feeling? book, and Raising and Emotionally Intelligent Child with Joan DeClaire), has born fruit in a highly effective intervention for parents with their children. Three randomized clinical trials were conducted by Australian psychologist Sophie Havighurst, showing emotion coaching to be highly effective at preventing and treating externalizing and internalizing disorders in children (see www.tuningintokids.org.au). Instead of trying to change your partner, be the change you wish to see in your relationship.